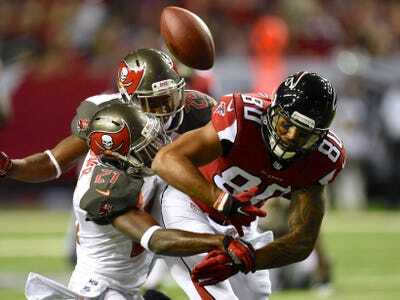 Dale Zanine/USA TODAY SportsThe Falcons are bumbling their way to the playoffs. Four years after the 7-9 Seattle Seahawks became the first team in NFL history to make the playoffs with a losing record, the NFL could see its first 10-loss playoff team this year and if it happens the league may finally get the change to the playoff format it desperately needs. If the season ended today, the 4-7 Atlanta Falcons would be in the playoffs and they are on pace to win just six games. To make matters worse, not only could the Falcons make the playoffs at 6-10, as NFC South champions they would host a first-round playoff game against a Wild Card team that is likely to have 10 or 11 wins (the Dallas Cowboys if the season ended today). If that happens, look for the NFL to finally make a change to the playoff format that the head of the competition committee has been proposing for years. Rich McKay, the NFL’s head of the competition committee has tried on at least two occasions to change the playoff format so that the teams that play during the first weekend of playoff games (seeds 3-6) are seeded according to their record and tiebreakers, regardless of whether they are a division champion or a Wild Card team. On one of those occasions, 18 of the 32 owners voted for the change but 24 votes were needed to pass. A 6-10 playoff teams − or worse, a 5-11 playoff team which is still possible − playing a home playoff game may finally be embarrassing enough to get the number of votes needed to make the change.